When I was a new mom with a head full of idealistic parenting goals I received feedback on some of the more controversial parenting choices I made. Sometimes the well-intentioned, but unsolicited, advice was more overwhelming than it was helpful. The most damaging recommendations were delivered in a way that made me feel as if I’d hurt my child if I didn’t follow them. These sorts of tips were usually of the all-or-nothing, black-or-white kind. Even though it’s no secret that I have a strong preference for attachment parenting my own children, I’d be lying if I said it was the only way to ensure your child will grow up to be a healthy, happy, successful adult. Anyone who tells you there’s a single correct way to raise a child is either lying or misled. Sure, my website is all about positive, gentle parenting but I write about those things to encourage parents who are interested in attachment parenting and want to learn more or to help parents who have committed to attachment parenting and need support. I don’t write about attachment parenting in order to convince every parent that it’s the only proper way to raise children. Honestly, it’s a leap of faith because we can’t know for sure. We can use science and anecdotal evidence, but in my experience, it was my intuition that pointed me to many of my parenting decisions. I chose to trust my intuition and take the advice of others with a grain of salt. I was warned that I would regret my decisions. And some of them I did regret. 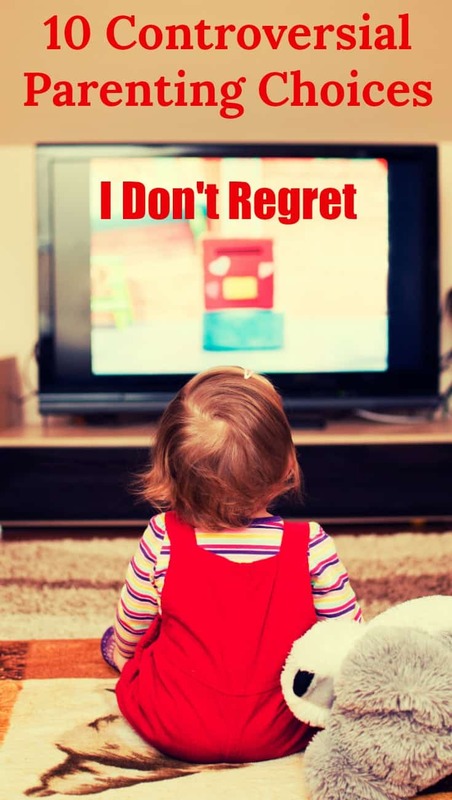 (Read about my biggest parenting regrets.) But most of them I didn’t. If you’re struggling with naysayers as you settle into your parenting preferences, I hope that my experiences with controversial parenting decisions will help you to remain strong in your convictions and let your intuition lead you. Only you know what’s best for your family. Recently, I’ve taken some time to reflect on the results of attachment parenting and other parenting decisions I’ve made. Here are ten controversial parenting decisions that I don’t regret making. This doesn’t mean they’re right for your family, of course. However, if you’re being told these choices never work out well, let me serve as an example to assure you that they can and they do. We’ve all heard about the dangers of screen time for children. While I agree that children shouldn’t spend the majority of their time in front of screens, I’ve never put limits on my boys’ screen time. On top of that, I allowed them to watch TV as toddlers because they enjoyed it and it allowed me to get things done or have a moment of peace. Now, my boys were born in 2001, 2003, and 2006 before smartphones and tablets so they weren’t glued to handheld devices. But if I’d had an iPad available when my boys were younger, I wouldn’t have hesitated to let them use it. The main reason my boys have never had a limit on screen time is that they’ve never needed it. They’ve always loved to play outside and two of them are athletes. I established a daily routine as a stay at home mom very early on that kept us from having tons of time to waste in front of a screen. However, on days when I didn’t feel well or we all just needed a break or the weather kept us inside they could watch TV (or, as they got older, play video or computer games) as much as they wanted. They seem to have a natural, internal preset that pushes them away from the electronics. I think this is helped along by the fact that they have many other things to do that don’t involve screens. You’ve heard the negative remarks about co-sleeping: “It’s not safe.” “They’ll never leave your bed!” And many more that I learned to tune out in my early years of parenting. I began co-sleeping in the hospital after my first son was born and practiced it in various forms for all of my children. I won’t tell you it’s safe for your family because I can’t do that. I will tell you it was the safest option for my family and I’m glad we did it. We had many sleeping arrangements over the years that we parented small children. Sometimes it was mom, dad, and baby in a bed. Sometimes one parent needed a break and slept in the guest room. Sometimes brothers shared a bed. We even once had all three boys sleep in the same room and turned the other two bedrooms into a playroom and a media room. That didn’t last long because, ultimately, despite the warnings that my children would never sleep alone, the boys wanted their own rooms for play and sleep. Overall, co-sleeping was a positive experience for us. My oldest slept on his own for part of the night by six months and the whole night by 11 months. My middle son was three when he slept some in own room and some with his older brother. Our youngest slept in our room or we brought a small folding mattress into his room until he was nine. Then one day he did some rearranging in his room and declared he wanted to sleep alone. And so he did. Our co-sleeping days were over. If you’re considering child-led weaning or you haven’t potty trained your two-year-old, you might get some flack from folks who believe racing toward weaning and the diaper-free life is the only way to raise independent children. Of course, it’s not. I preferred to take a slower approach and allowed my children to tell me when they were ready for big steps like sleeping alone, weaning, using the potty, etc. My oldest was four when he weaned, my middle son was 27 months, and my youngest was 15 months. My oldest two sons were around 2.5 years old when they were fully potty trained. My youngest was closer to 3.5. Neither weaning nor potty training was difficult. It happened slowly, over time, and naturally. Letting my children lead helped them to be more internally motivated, allowed them to find out what was right for their individual bodies and emotions, and was less stressful for us both since we weren’t on a time line to give up nursing, diapers, co-sleeping, or other things. Since I wholeheartedly support a mother’s right to nurse her baby anywhere her baby is hungry it may seem surprising that I chose not to breastfeed in public. Since I wrote an article about my choice to avoid breastfeeding in public I won’t go into a lot of detail here. Read my article to find out why I didn’t breastfeed in public. It’s probably not why you think. I successfully nursed my children in calm, quiet settings away from people and I’m glad I did. It worked well for me and my family. I guess I was kind of forced into this one. My attempt to retain my sanity while caring for three children under the age of five forced me to give up some of the more idealistic parts of attachment parenting. I wanted my babies to take bottles and pacifiers but they wouldn’t. I used the baby swing often with my second and third children instead of holding them all.the.time like I did with my oldest. When my oldest preferred his own crib to co-sleeping at six months old, I went with it. At the time I was afraid to share these things with my attachment parenting message board friends because I thought they’d think less of me as a mother or question my commitment to AP. This one is a big deal. Apparently. Of all my controversial parenting choices, this is the one I received the most advice against. I was told, “All kids need to be spanked at some point.” I was assured by others that I’d lose control of my children or raise brats. I’m 17 years in with three teenagers and I haven’t lost control yet. Of course, my goal was never to control my children, so maybe that’s why. My boys are certainly not brats. And they definitely never needed to be spanked. I can’t think of a single situation where I can say spanking them would have achieved a better outcome. I wrote an article about why I don’t punish my children. If you’re interested in this method of discipline, be sure to check out my article that gives you thirteen alternatives to spanking your child. I’m a firm believer in following your bliss because that’s where I believe your purpose lies. I think it’s important to expose children to many activities at a young age and see what sticks. If an activity doesn’t resonate with them they should be allowed to let it go. I know the argument against this practice goes something like this: If your child quits the team he’s letting down the team. If your child quits an activity he’ll learn to be a quitter. In my experience as a soccer coach’s wife and a soccer mom I’ve noticed that the kids who don’t want to be there are already hurting the team. If I let my child quit an activity that doesn’t spark joy he’ll have the time and emotional energy to find an activity that does. Life is too short to waste time doing optional activities that you don’t enjoy. There are far too many required tasks in life that you can’t say no to (dishes, anyone?) to hang on to activities that you dislike that you CAN say no to. Okay, so we do make time for special dinners at home together as a family once every couple of weeks. We don’t sit down together every night, though, and I don’t regret that. I wrote all about why we don’t eat dinner together as a family, so you can read all about it there. This practice has led to our dinners together being anticipated with excitement and quite special. We usually follow dinner by playing cards or board games. Our occasional family dinners are much more fun than the every-single-night family dinners I had with my parents where I tried to finish as quickly as possible to get away from the boring religion/politics/fatalistic-what’s-wrong-with-the-world conversations my parents had – without input from me, thanks. That’s all true, but before you call me a hypocrite hear me out. While I do wish I had never introduced my children to sugar at home and had kept a mostly sugar-free house from early on, I think forcing my children into an all-real-food life would only set them up for failure later on. I’m glad they eat junk food now and again. It will keep them from going crazy when they are adults and have to control their own diet. Giving them some control now helps them to learn how to handle the unhealthier aspects of life without falling completely off the health train. I wrote an article about why I let my kids eat junk food that explains more. If you’re a homeschooler and have never encountered anyone who told you all the reasons homeschooling was a bad idea – well, you’re a rare case. When I first considered homeschooling my children I heard all kinds of negative things about it. I was actually told my boys might “turn out gay” if they were with me all day. I was told they’d miss out on the social aspect of school. I was warned they might get behind in school or that I might burn out and regret my decision. I’ve been homeschooling for over a decade and so far I have no regrets. While homeschool burnout is real, it hasn’t been my experience. You may be struggling with one of these controversial parenting decisions or some other choice I didn’t write about here. Be sure to let your intuition about the matter be the loudest voice you hear. Do your due diligence and always weigh the pros and cons in every situation, but ultimately remember that you know what’s best for your children and your family. Get parenting support and connect with other moms – join us in our private Facebook group for Positive Parenting Support.